this afternoon after taking the trailer to Jimi for some minor additions and alterations, I decided to try to fit the Oricom UHF300 Micro CB into the row of switch blanks just below the row of switch blanks next to the fog light switch to the right of the steering column. Scary stuff for me, as I don't like making irreversible alterations to cars, even of such a minor nature! I took heaps of pictures, and will post them in the subsequent posts that I am reserving for the purpose, along with very detailed instructions. I haven't got the aerial/s and Z bracket for mounting the aerial yet, but they shipped yesterday. Ignition switched power is available from an unused plug block that is hiding behind the top row of switch blanks (black and red with yellow stripe wires, IIRC). Not yet connected to the power. 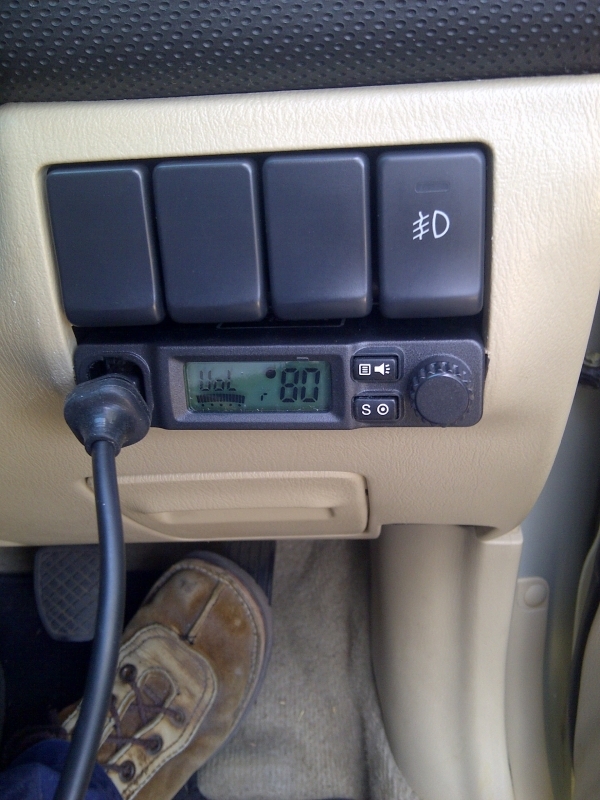 There is a ton of room for an extension speaker behind the lower dash part that the rows of switches are attached to. Firstly, I made LOTS of measurements and trial fittings before I cut anything ! 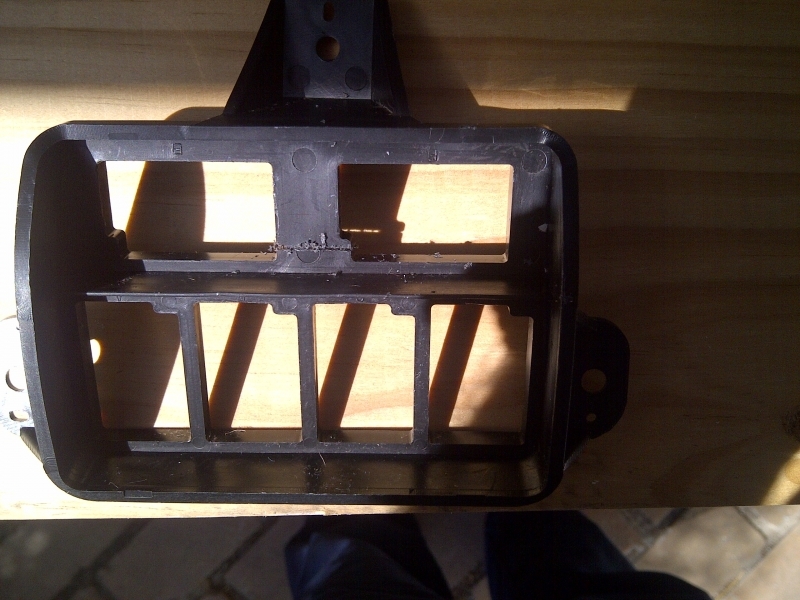 The black switch block frame is separate from the dash front, and is held on by three screws from behind. 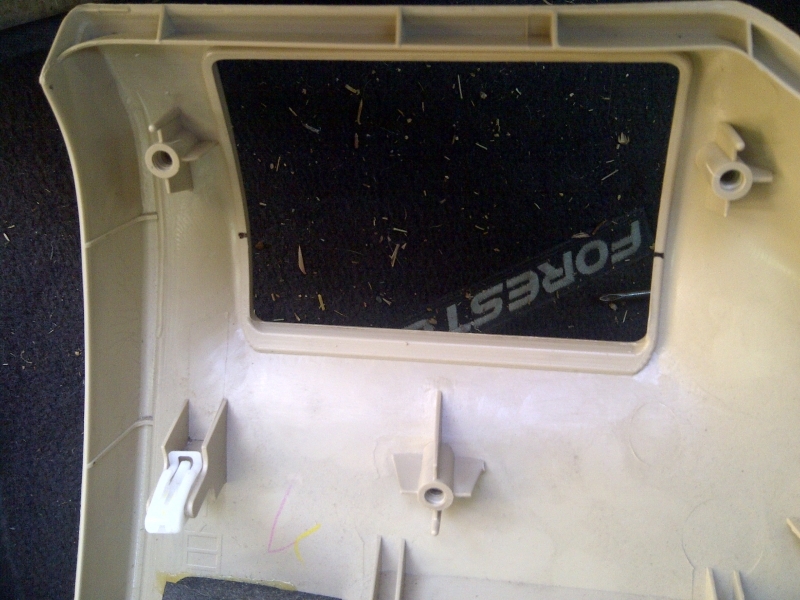 Remove the two screws holding the bottom of the dash front to the metal framing, then gently lever the panel out of the three press fixings along the top. Remove the fog light plug from the back of the switch. 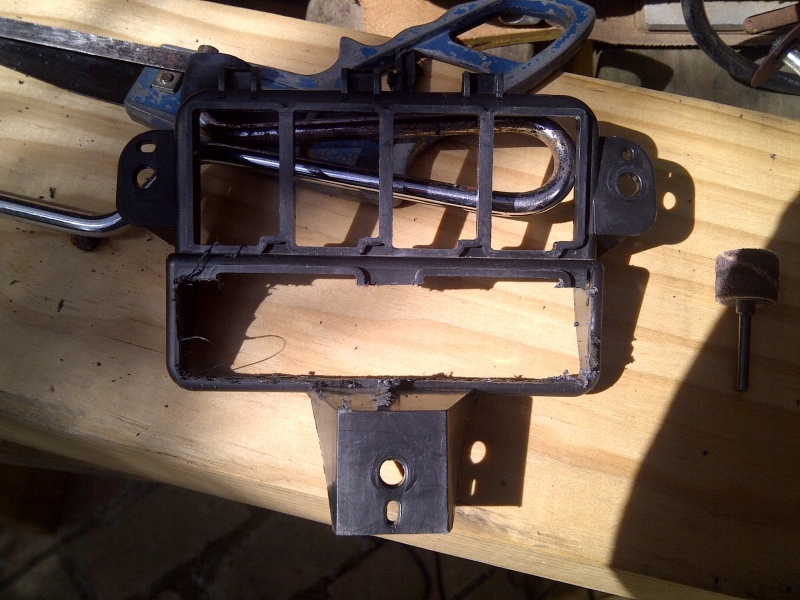 Remove the three screws holding the switch block frame to the rear of the dash front. 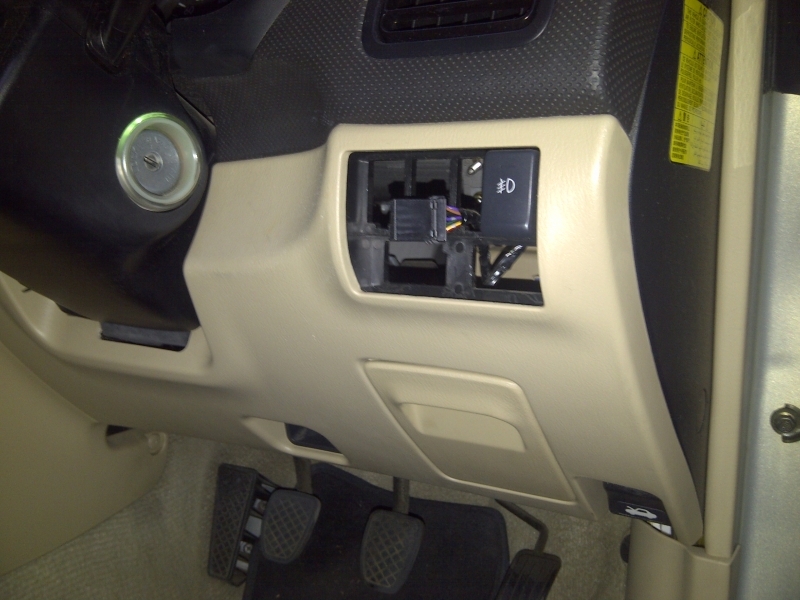 It is necessary to remove a small amount of material from each side of the lower dash front opening. Detailed instructions and photos to follow. 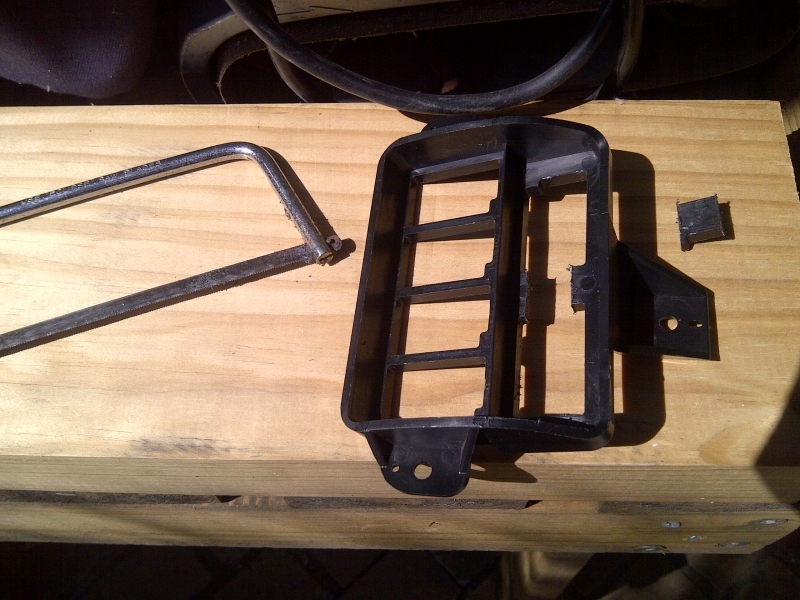 I will make a purpose-built frame to replace the one that comes with the unit to both strengthen the switch block frame, and more securely mount the radio unit. 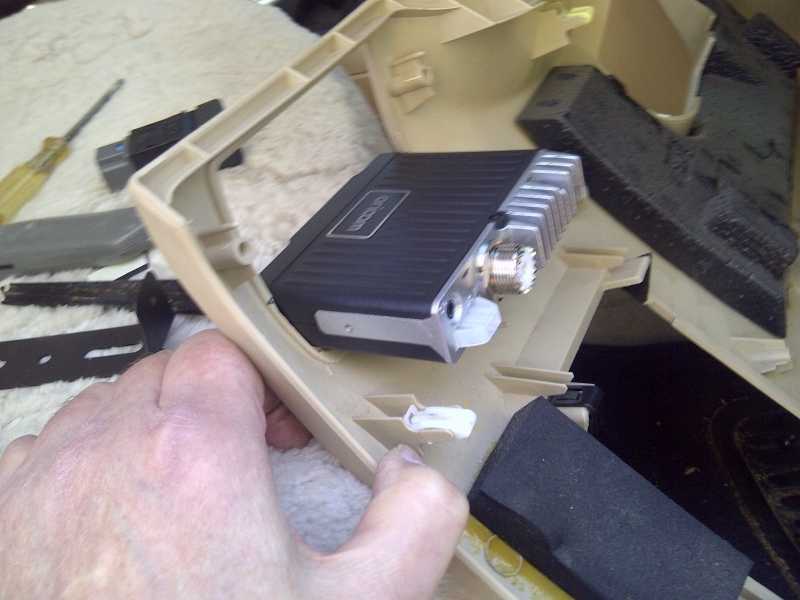 I also intend to drill the dash front so that the unit's speaker can be heard. If this doesn't work, I will wire up an auxiliary speaker nearby. I haven't figured out the best place to mount the microphone yet, but if it is to the dash front, I will need to make a small reinforcing plate for the back of the mounting plate, behind the dash front. Otherwise I suspect that the force required in normal use would just rip the mounting screws out of the dash front, making a hell of a mess of it. Here's a teaser photo of the unit mounted. It is not yet connected to power or aerial, and hasn't got a proper mounting plate holding it in place. It cannot move, but it isn't satisfactory yet. The unit isn't square in the hole yet, as the hole is still a bit rough around the edges (like me ... ), and the standard mounting plate will not hold it square. Have just got time to start filling in the detail of this. These instructions are for the series II SG Forester XS MY06. In other models and years, there will almost certainly be differences. The MY06 XS has a switch panel to the right of the steering column in RHD cars. 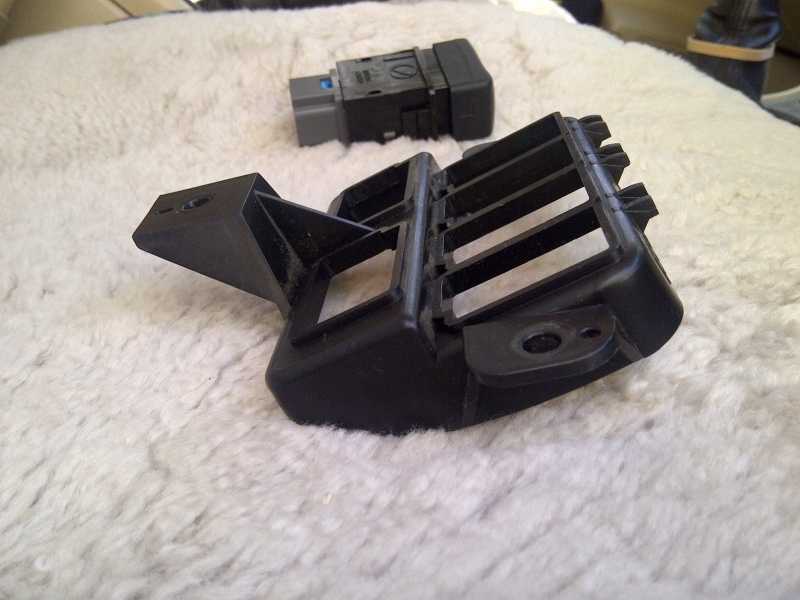 This has one operative switch for the fog lights, and three blanks in the upper part. The lower part is one panel that looks as if it is solely for decorative purposes. It conceals a further two switch positions that are arranged horizontally, rather than vertically. This is where I have mounted the Oricom CB unit. The first thing is to carefully prise out one of the switch blanks. The others can then easily be removed with some help from a finger behind them. Alternatively, one can remove this panel completely by undoing the two screws at the bottom and gently levering the panel out of the clips down the door side of it. 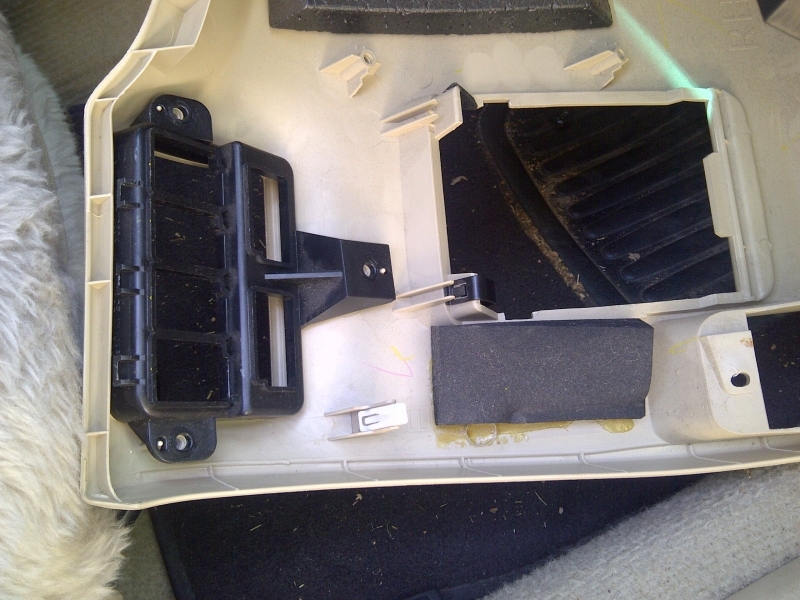 One of the retaining screws is at the bottom of the dash panel over next to the foot rest, the other is to the right of the coin bin below the switch block, directly above the bonnet release. 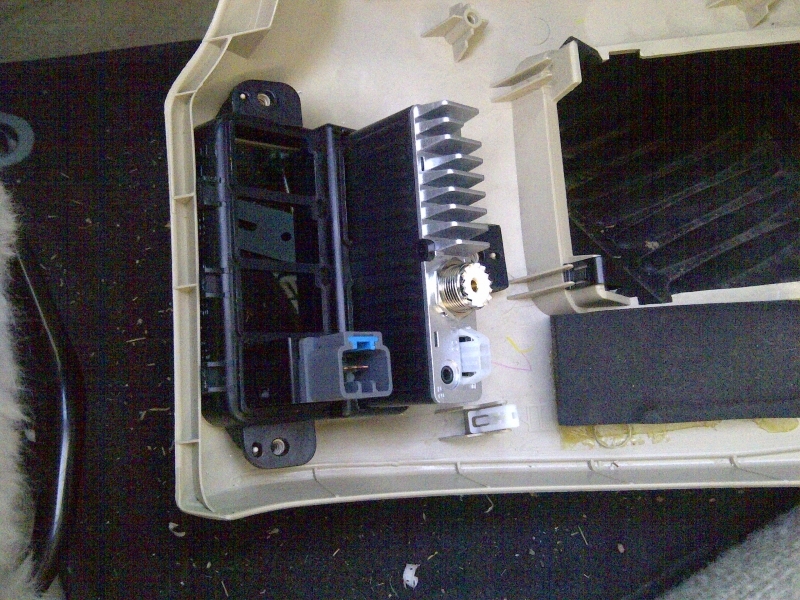 This is after the panel has been removed, and the three screws holding the frame of the switch block have been removed. Note that I have removed the coin bin. This is done by opening it, then gently pulling upwards and wriggling slightly from side to side. When re-installing, make sure that it is properly aligned before pushing it back down over the hinge that's part of the dash panel. 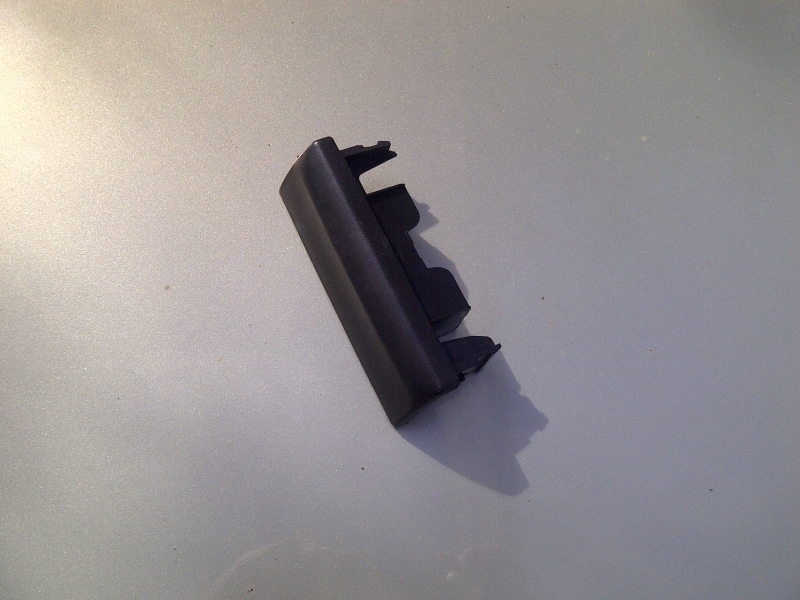 Note also two of the clips that hold the dash panel in place in addition to the two screws (one moulded into the dash panel on the RHS; and a white one that is detachable on the LHS near my thumb). 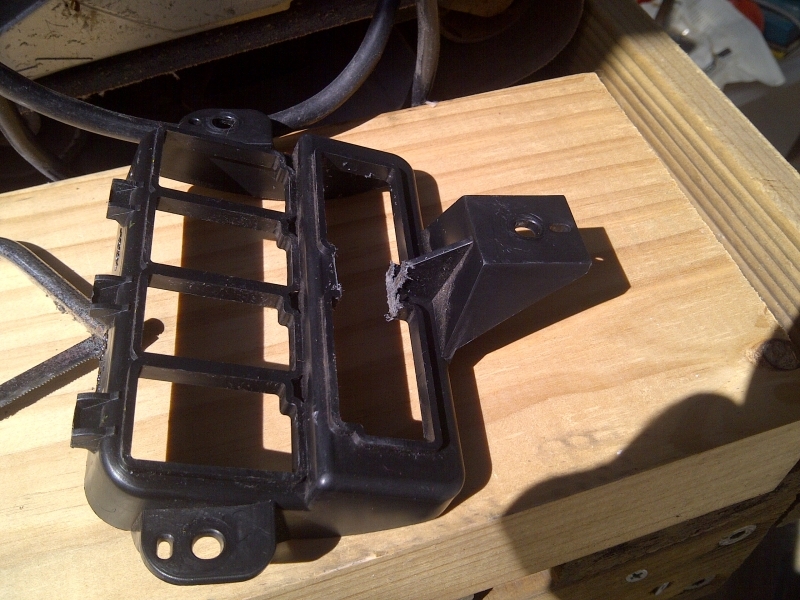 There are a number of these, and they need to be lined up correctly when re-fitting the dash panel. Note also that there is a heap of air space around where the unit is fitted. This should help it to remain reasonably cool in use. If it does get too hot, break into the dash vent tube, and put in a small tube to blow air over the cooling fins of the unit, maybe? IMO, this should not be necessary. reserved #2 - Modifying the switch block frame. OK, this is the tricky part. The frame is quite strong in its original form. 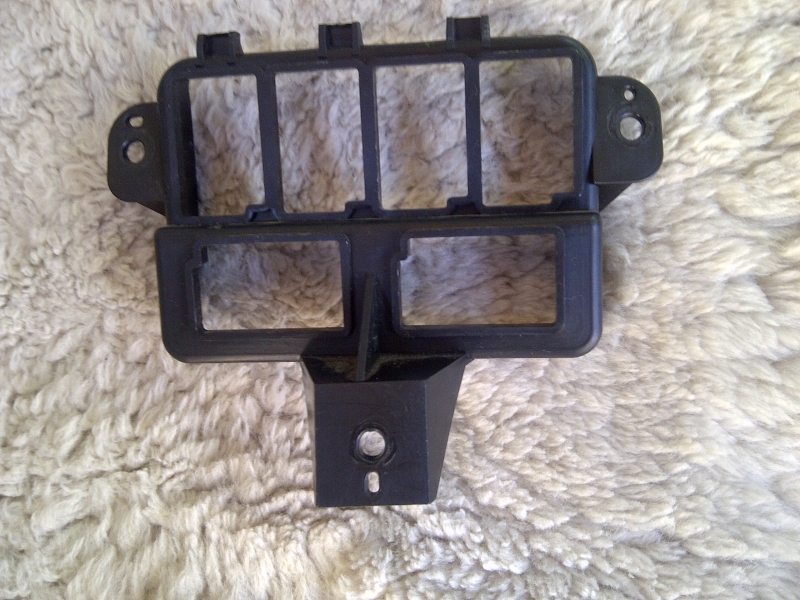 As you remove more and more material so that the Oricom unit will fit into its lower half, it gets progressively weaker, specially after the triangular bracing part has been cut. TAKE GREAT CARE to support the frame at all times while cutting, trimming and filing. I suspect that it would be all but impossible to get another one (without buying a complete s/h dash assembly for some exorbitant price ... ). SO DON'T BREAK the flaming thing! I chose to make the first cut here, as it requires the most force to be applied, and opens up the part that will allow me to get access to the other parts that need to be cut and trimmed. I made this cut with the fine hacksaw in the next photo. Note that I have made this cut away from the edge of the frame. It is approximately the position where the top of the unit will be when mounted. I measured this position fairly carefully so that I would not have to make more cuts than necessary after the frame had been weakened (or trim). The frame is upside down in this photo (the top when in the car is at the bottom of the photo). Note the position of the cut relative to the switch mounting 'key'. 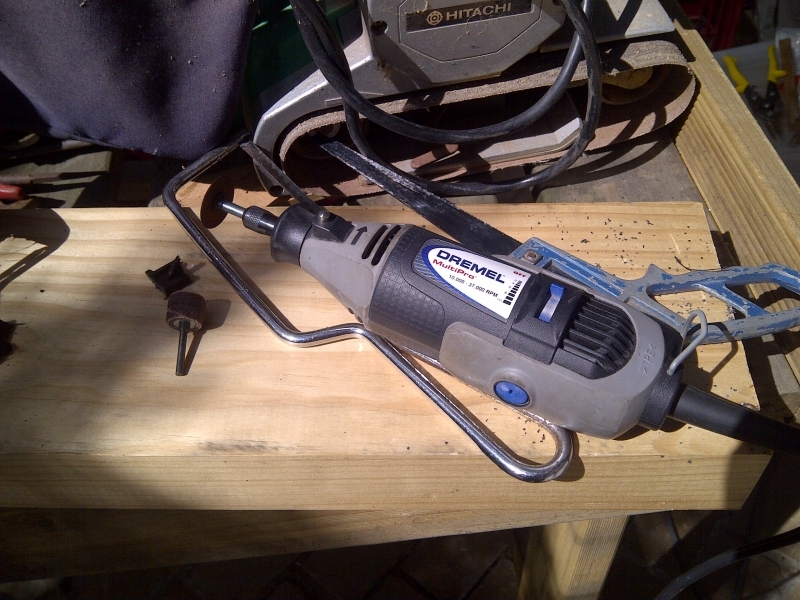 It is very important not to run the Dremel tool too fast, or it just melts the plastic instead of cutting it! 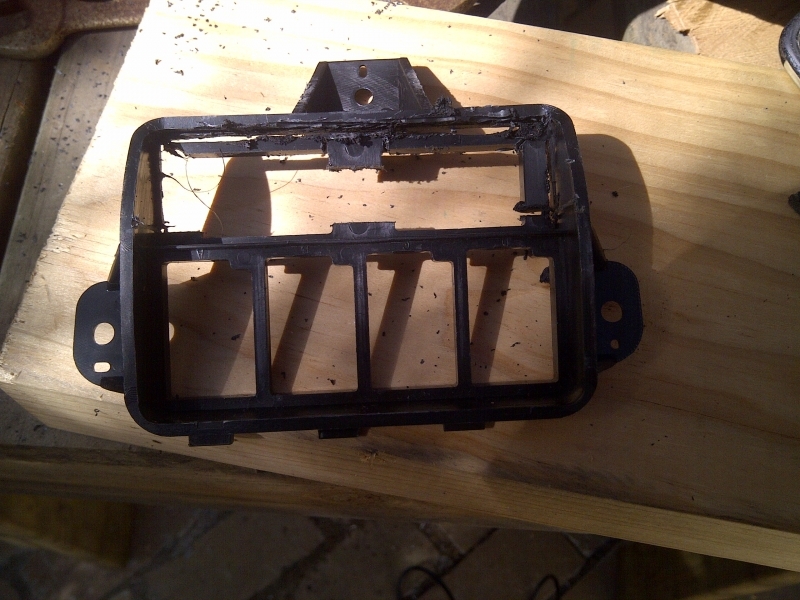 I intend to make an aluminium bracket that attaches where the Oricom bracket does to the unit, but that wraps over the edges of the frame and will drill and tap some very fine screws through this bracket into the sides of the frame. Under the unit, it may be necessary to reinforce where the triangular brace has been mostly removed. That is awesome, now you have me really thinking! Great job so far Ratbag... very curious about where the rest of it is going!